If you are searching for the best – and only – day spa Durbanville has to offer, you have found it! 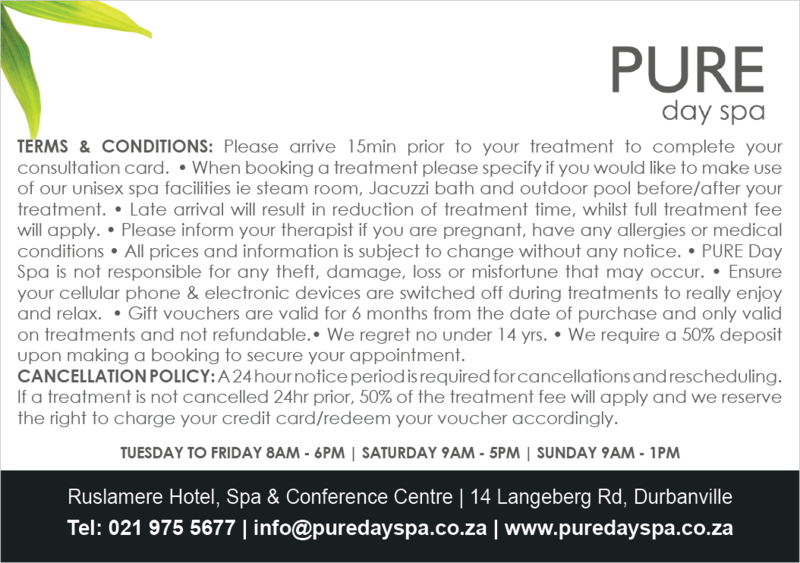 At Pure Day Spa, we offer an array of spa packages for our clients to choose from. You are welcome to purchase these packages for yourself, or as a gift for a friend or a loved one with one of our tailored gift vouchers. Spend a little more time with us at the most relaxing day spa, and enjoy a complete spa experience tailored to restore your all-over sense of well-being. We provide a range of tailored and unique packages, which suit any budget. Our Mother & Daughter package is the perfect treat for Mother’s Day – or just because! This package takes 2-and-a-half hours, and during this time, you and your mother or daughter can completely relax and indulge – with a back, neck and shoulder massage and facial. If you are feeling romantic, our Couple’s Retreat is the perfect present for your significant other. In this package, we will treat you to a relaxing body scrub and clay mask, followed by a rejuvenating Swedish Massage… and a glass of sparkling wine! Our Pure Indulgence Package is one of the most popular packages we have on offer, and clients can luxuriate in our spa, with a body exfoliation followed by a hot stone massage and other fabulous treatments. 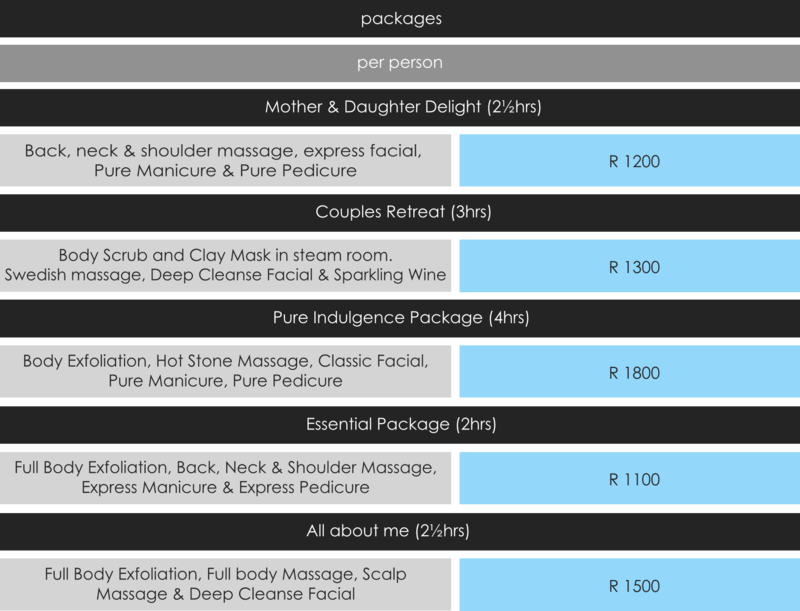 For those who are feeling a little selfish, our All About Me package is the perfect choice for you! At the best day spa Durbanville has to offer – Pure Day Spa – we will treat you to a 2-and-a-half-hour session, including a body exfoliation, hot stone massage, a facial and a stunning manicure and pedicure – sounds like heaven, doesn’t it? Why not book with us today and spoil yourself or a loved one?